Planning a special event but you don’t have enough staff to handle all the phone calls and emails you’re expecting as the event draws near? Create a thorough Frequently Asked Questions page at your website. But don’t limit the questions only to those that people ask frequently. Also known as FAQs, these pages address the concerns of consumers who might be on the fence about doing business with you or visiting your event. 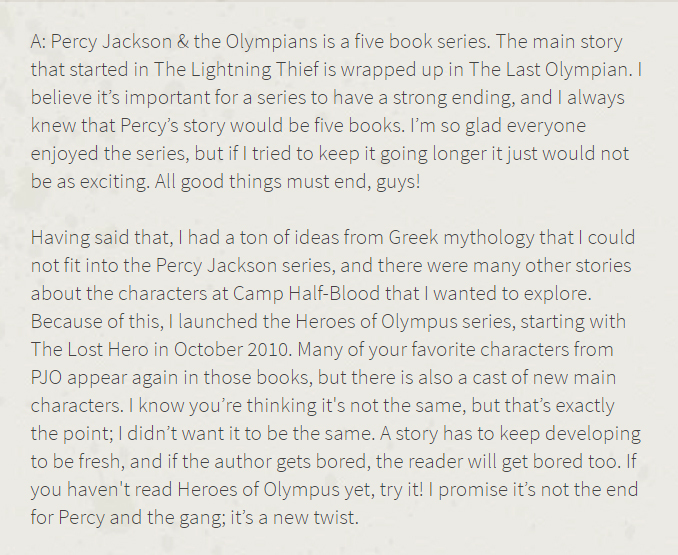 If you have a blog, you can devote an entire post to FAQs, then link to it from the navigation bar on your homepage. They save you valuable time. No more tedious hours answering emails and taking phone calls from people who need answers they can’t find at your website. They save your customers time. Ever call someone looking for information and you’re put on hold for 20 minutes or told to call back during regular business hours? FAQs rank well in search. If someone searches for information and types a question that’s a close match to one on your FAQ page, you can pull traffic to that internal page at your website. You can use FAQs to entertain, not only inform. In a few minutes, I’ll show you how an author does that. They can help you recruit sponsors, volunteers and vendors. They let your personality shine, especially if you answer quirky questions. A few weeks ago, when I planned to attend Harley-Davidson’s 115th Anniversary celebration in Milwaukee, I had lots of questions about the event. 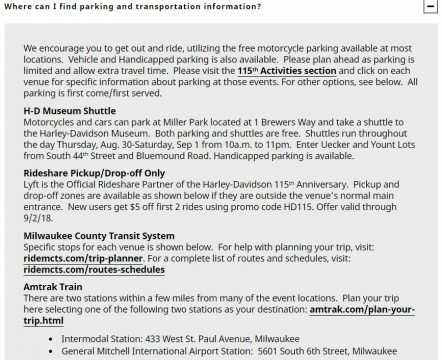 I knew parking would be a problem but had heard that shuttle buses would be available at Miller Park, Milwaukee’s baseball stadium located less than 10 minutes from the Harley Museum where most of the activities could be found. But where exactly do we catch the shuttles in that giant parking lot? After calling the Harley Museum’s phone number three times over two days and hearing a recorded message that there might not be enough staff to take calls, I went to the website looking for an FAQ page. Sure enough, there it was. I found this detailed information that addressed transportation and parking questions from locals who would be attending, and from the thousands of out-of-towners who would arrive on motorcycles, trains, planes and buses. Can I buy beer, wine or mixed drinks? Do you have early bird specials or coupons that offer a discount on admission? What about discounts for senior citizens or veterans? Do you offer refunds if I can’t attend? Is the event frequently sold out? Do you have special pick-up and drop-off points for Uber and shuttles? What times will shuttles be running? Who do I contact if I want a vendor booth? Who do I contact if I want to advertise at the event? How can I be a sponsor at next year’s event? Who do I call if I want to volunteer? Is there a number to call to learn if the event has been canceled? Are air-conditioned rooms or tents available? Your FAQ page can also tell people how to receive text notifications about the event. It can lead them to your Facebook page. It can give one or two phone numbers to call, or an email address, if they have questions they don’t find on your FAQ page. Do you have a YouTube channel where they can see videos of past events? Are there unusual ways to use it? What major mistakes should I avoid when using it? Do you offer customer support after I buy it? 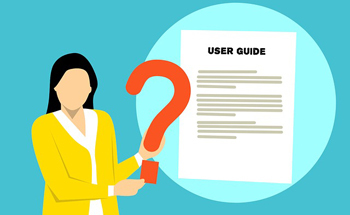 Do oyou have a user guide? What if I don’t have my receipt and I want my money back? What if I’m not happy with the service I received? Do you offer discounted packages if I want to buy a lot of your services? You don’t offer a service I need. Who can I call to make a suggestion? If I can’t afford your services, do you have lower priced products that can help me? 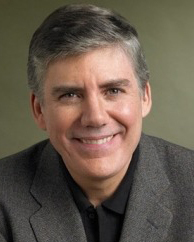 Rick Riordan is the #1 New York Times bestselling author of over 20 novels for young readers, including the Percy Jackson series, the Kane Chronicles, the Magnus Chase series and the Trials of Apollo. He is also the author of the multi-award-winning Tres Navarre mystery series for adults. I love Rick’s FAQ page that includes a whopping 37 questions. He has even placed them into these categories to make it easier for readers to find the answers they want: Books & Series, Characters, Upcoming Releases, Movies, Events & Contact and Other FAQ. Authors can include some of these ideas on their own FAQ pages. He educates readers by explaining why he writes the way he does. That’s a logical question considering his huge fan base. Rick not only educates, he also entertains. This part is easy. Pay attention to the questions people email you and move them into a folder in your email program. If you’re a public speaker, make note after your presentation of questions from the audience. Your FAQ page can be a work in progress. If you have FAQs at your website, tell us about it and link to it from the Comments below.